Organizing for justice. Migrant and immigrant rights in the U.S.
ANN ARBOR, Mich. — Students at the University of Michigan held a Migrant and Immigrant Rights Awareness and Labor Law Roundtable conference here Jan. 17-19. The gathering, organized by the students of MIRA (Migrant and Immigrant Rights Awareness) and the Labor Law Roundtable, with the support of UM faculty and other sponsoring organizations, was projected as the first of a series of conferences that will address issues of immigration and social justice. Baldemar Velasquez, founder and president of the Farm Labor Organizing Committee (FLOC) of the AFL-CIO, keynoted on FLOC’s new initiatives in North Carolina. Velasquez grew up in Toledo, Ohio, where his grandparents had joined thousands of seasonal migrants during the Mexican Revolutionary War era after the fighting ruined many peasant farmers. Over time he mastered English and got good schooling, but the linguistic challenges affected his academic performance, and his low grades never reflected the intellectual abilities he later showed. But some politicians and “talking heads on TV” are misleading the American public about the realities of immigrant labor, he said, and whipping up fear, hatred and threats of deportation, imprisonment and violent assaults by vigilantes and other hate groups at our southern border. Most U.S. citizens, he said, are uninformed about the impact of the NAFTA (North American Free Trade Agreement). The agreement has resulted in the ruin of 1.3 million Mexican corn farmers who have migrated to seek work because they cannot compete with the cheaper, subsidized corn dumped into Mexico by the giant U.S. corn industry. Velasquez also noted that the United States had forced Mexico to privatize public national farmlands, land that could be farmed more effectively under communal or nationalized ownership system. “Today, Mexican workers are forced to pay bribes that hike what should be a $360 cost for visa and other legitimate fees to payoffs of $1,800 to $3,500 to corrupt police officials, job recruiters and ‘coyotes’ who carry the workers into the States. “These are slave labor programs almost as bad as the Braceros Program that was ended in the 1960s,” Velasquez said. After being extorted for high fees and risking their lives to sneak across the border, they are denied the right to complain about working conditions, health care or their pay. “Anyone who speaks up is fired, deported and then blacklisted by the U.S. Customs Service from ever returning to the U.S.,” he added. The growers use not only the Customs Service but also the U.S. Labor Department, “which does not adequately enforce or oversee labor regulations,” to carry out the systematic exploitation and oppression of immigrant workers. The upshot in the United States, he said, is that a well-designed, formal guest worker program is required. However, FLOC opposes President Bush’s guest worker proposal, which ties workers to a single employer on disadvantageous terms. 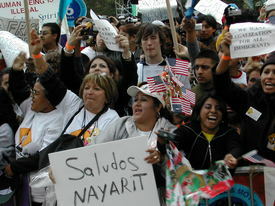 Velasquez’s group has instead supported the AgJobs bill, which would grant permanent residency to farm workers after a certain number of years in the fields, and the McCain-Kennedy immigration bill of 2005, which, while it includes guest worker provisions, provides more support for migrant worker rights, family unity and a path to citizenship. Despite obstacles imposed by Mexican officials who arrest and harass union organizers and U.S. growers who deploy a variety of legal and illegal tactics, FLOC has succeeded in organizing several industries. Velasquez says FLOC has gained support not only from the left (though he knocked some segments as “too lazy, inactive, unimaginative and arrogant”) but also from evangelical youth from Republican families. “Most Americans want to get America right, even if to some that means ‘right with God.’” Velasquez said. He recounted how Toledo-area students of a Christian school had responded to his appeal to raise money for the widow in Mexico of a migrant laborer who had died in North Carolina as a result of hazardous working conditions. During FLOC’s successful union organizing drive in Toledo, all segments of the community backed the worker-led boycott of the local pickle company. Farmers and anti-union “right-to-work” groups have continued to fight against the union even after it won its organizing election, but they lost a $12 million judgment against FLOC before the National Labor Relations Board and have failed to break the collective bargaining agreement so far. Panelist Lance Compa, a senior lecturer at Cornell, focused on the human rights dimensions of the immigrant workers’ experiences in the meatpacking industry. “In 1906 Upton Sinclair’s novel ‘The Jungle’ exposed the horrendous conditions in meatpacking,” Compa said. At first, the novel’s impact was limited mainly to improving meat quality, rather than labor standards. “As Sinclair put it, ‘I aimed at people’s hearts but hit their stomachs,’” Compa recalled. But the great union drives of the 1930s enabled meatpackers to gain wages equal to those in other major industries. In a hog-processing plant in Tarheel, N.C., where 30,000 animals are killed daily, a worker named Glen Birdsong was sent to clean “byproduct” from a slaughter tank one week into his job. Birdsong was alone, (“that was illegal,” Compa noted) and he had no safety belt (“also illegal”). When fellow workers noticed his absence after 30 minutes, they found Birdsong dead at the bottom of the tank, overcome by toxicants. OSHA fined Smithfield Foods, owner of the plant, $4,000 for violating federal standards, Compa said. At a poultry plant in Virginia owned by Tyson Foods, workers on the butcher line were required to make 25,000 cuts per shift. Room temperature was kept at 68 degrees, which meant the line had to be shut down for five minutes every hour to be washed to prevent growth of harmful bacteria. At a Smithfield plant in Virginia, investigators proved that in 1997 the company organized an assault on a leading plant activist to intimidate the workers before a certification vote. The union drive failed and the election is still under appeal. At a meatpacking plant in Nebraska, the company called in the Immigration and Naturalization Service in 2001 to deport 200 workers before a union election. That one was lost, too. “All of these were violations of international human rights that the U.S. has signed, and they must be analyzed, publicized and fought as such,” Compa said. Compa said what is needed is a reform of the OSHA Act to make regulation more effective and also an immigration policy that protects workers’ rights. The experiences of workers must become issues in local, state and national elections, he continued, and campaigns at universities like Cornell, Nebraska, Duke and the North Carolina, in which students organize to support workers, need to spread across the country. Panelist Fran Ansley, a law professor at the University of Tennessee, described how community involvement had helped organize 700 workers at a chicken-processing plant in east Tennessee. Ansley pointed out that east Tennessee plants moved to Mexico but now Mexicans have immigrated “next door to us right in Tennessee.” An old Koch Foods chicken-processing plant that was once in Morristown, with 99 percent white and Black workers, is now a modern structure on the outskirts of Morristown “with Latino workers doing 99.9 percent of the hard work,” she said. Organizers made good use of “legal resources via federally funded groups and others, finding a union, the United Food and Commercial Workers, that was willing to get in a fight and also open to work with community partners like Jobs with Justice and others,” and identifying Koch Foods as an “attractive target” because of its poor record in labor relations. Also important was the priority the organizers placed on “dealing with the language issue by providing simultaneous interpretation at all meetings and home visits, thanks to the key participation of an intern from Tennessee’s renowned Highlander Institute,” which focuses on social justice. The drive included vigils, boycotts, church folk and letter-writing campaigns to politicians and the press, Ansley said. The Migrant and Immigrant Rights Awareness conferences aim to bring together leading academics and activists, as well as union leaders and students, to discuss recent developments and new strategies in the fight to organize migrant and immigrant workers. In addition, conference participants are discussing the creation of a university-community-labor partnership in support of immigrant workers in the Ann Arbor-Ypsilanti area. Speakers included Jennifer Gordon of Fordham Law School; Baldemar Velasquez, president of Farm Labor Organizing Committee; José Oliva, director of Interfaith Workers’ Rights Center; Lance Compa of Cornell University’s School of Industrial and Labor Relations; Perez Rosenbaum of Michigan State University; Fran Ansley of University of Tennessee Law School; Ben Davis of the AFL-CIO Solidarity Center in Mexico City; and Kate Shaughnessy of Washington, D.C.-based Coalition for Comprehensive Immigration Reform.